Background: Sputum analysis is used increasingly to assess airway inflammation in patients with chronic obstructive pulmonary disease, including those with chronic bronchitis and bronchiectasis. However, it is not known whether dithiothreitol (DTT), a reducing mucolytic agent regularly used to homogenise sputum, affects the detection of inflammatory mediators in the sputum soluble phase from such patients. Methods: Thirty two spontaneous sputum samples were collected from 13 patients with chronic bronchitis and 17 with bronchiectasis. An aliquot from each sample was treated with either freshly prepared 0.1% DTT plus normal saline (NaCl) or NaCl alone, then ultracentrifuged to obtain the sputum sol phase. Interleukin (IL)-1β, IL-6, IL-8, leukotriene B4 (LTB4), secretory leukoprotease inhibitor (SLPI), alpha-1-antitrypsin (α1-AT), and tumour necrosis factor alpha (TNFα) were measured by ELISA, and neutrophil elastase (NE) and myeloperoxidase (MPO) by chromogenic substrate assay. 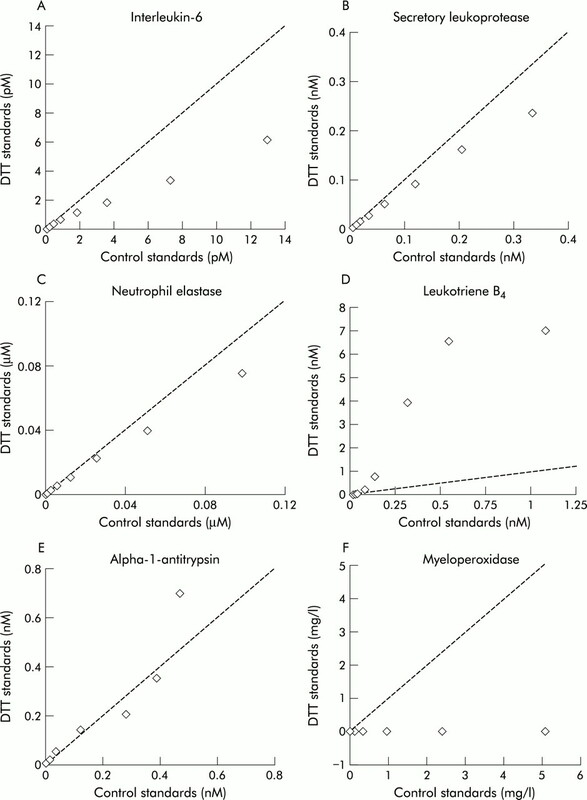 The effect of DTT on the detection of assay standards was also determined. Results: Median levels of IL-1β, IL-6, IL-8, SLPI, and NE were similar in the DTT and NaCl treated samples. There was a significant reduction in median (IQR) levels of detectable TNFα (0.07 (0.00–0.47) pM v 0.90 (0.06–6.98) pM, p<0.001), LTB4 (1.67 (1.31–2.64) nM v 2.29 (0.95–4.22) nM, p<0.05) and MPO (0.00 (0.00–0.00) mg/l v 4.48 (0.00–33.66) mg/l, p<0.001) and a small increase in the median α1-AT concentration (0.05 (0.03–0.08) nM v 0.03 (0.02–0.08) nM, p<0.01) in the DTT treated samples. DTT had no effect on the assay standards for IL-1β, IL-8 or TNFα, but at higher concentrations it did affect IL-6, SLPI, NE, and LTB4 standards (43%, 70%, 76% and 643% of control value for top standard, respectively) and at all concentrations DTT completely abolished MPO activity. Conclusions: Sputum processing with DTT significantly reduces the detectable concentration of TNFα, LTB4 and MPO, and produces a small but significant increase in median α1-AT levels. To avoid this problem we recommend that an untreated aliquot of sputum be retained for cytokine analysis, unless the assay has been specifically validated. Sputum analysis is used increasingly as a non-invasive method of assessing airway inflammation, both in terms of cellular indices and soluble mediators of inflammation.1–3 However, different methods of sputum processing—for example, the use of mucolytic agents such as dithiothreitol (DTT)—may influence the detection of these soluble mediators. Studies have confirmed that sputum treatment with DTT, and its optical isomer dithioerythritol (DTE), significantly improves total cell counts and cytospin quality.4,5 However, DTT also has the potential to interfere with the detection of inflammatory mediators in the sputum sol phase, either by affecting the three dimensional structure of proteins causing the release of mucus bound molecules, or by interfering directly with the immunoassay. To our knowledge there have been no previous studies of the effects of sputum processing with DTT on the detection of the relevant inflammatory mediators in sputum from patients with chronic bronchitis and bronchiectasis. The comparison is important given that sputum processing protocols often include treatment of the sputum sample with DTT before cytokine analysis.8 We have therefore investigated the effect of sputum processing with DTT on the soluble phase concentrations of IL-1β, IL-6, IL-8, leukotriene B4 (LTB4), secretory leukoprotease inhibitor (SLPI), alpha-1-antitrypsin (α1-AT), tumour necrosis factor alpha (TNFα), neutrophil elastase (NE), and MPO. We have also examined the direct effect of DTT on the immunoassay for each mediator. Thirty two spontaneous sputum samples were collected over 4 hours (from rising) from 17 patients with clinical and radiological evidence of bronchiectasis (mean (SD) age 64 (14) years, forced expiratory volume in 1 second (FEV1) 66.7 (24.7)% predicted, forced vital capacity (FVC) 87.2 (21.4)% predicted, FEV1/FVC 60.6 (14.0)%) and 13 patients with chronic bronchitis as defined by daily sputum production for at least 3 months of 2 consecutive years9 (mean (SD) age 60 (12) years, FEV1 40.2 (24.0)% predicted, FVC 71.4 (29.7)% predicted, FEV1/FVC 45.6 (16.2)%). The protocol for sputum processing was modified from that recommended by Pavord et al.1 Two aliquots of whole sputum weighing approximately 1 g were taken from each sample. One was treated with freshly prepared 0.1% DTT (Sputolysin; Calbiochem Corp, San Diego, CA, USA) at a ratio of 4:1 (v/w) and the other with four volumes of normal saline (NaCl) as a control. After treatment each aliquot was briefly vortexed then rocked for 15 minutes at room temperature. An additional 4 volumes of NaCl was added to each aliquot which was then rocked for a further 5 minutes. The sputum sol phase was then obtained by ultracentrifugation (50 000g for 90 minutes at 4°C) and the supernatant stored at –70°C until required. We have previously reported the validation of the IL-8, LTB4, SLPI, NE, and MPO assays for use with untreated sputum samples from patients with chronic bronchitis and bronchiectasis.12 The remaining assays (α1-AT, IL-1β, IL-6 and TNFα) were also validated using the same methods to ensure good recovery before the study reported here. The lower limit of mediator detection in sputum (which is greater than the lower limit of the assay due to the sample dilutions required to achieve mediator levels within the working range of the assay and to remove interference from elastase), intra-assay coefficient of variation, and the recovery of mediator from untreated sol samples spiked with a known amount are shown for each assay in table 1. Sol phase measurements were performed blind on coded supernatants and mediator concentrations below the lower limit of detection of the assay were taken as zero for statistical purposes. To determine the possible effect of DTT on each assay, one volume of assay standard (at nine times the usual concentration of the top standard) was mixed with four volumes of DTT and four volumes of NaCl. The final concentration of the assay standard in the mixture was therefore equivalent to the concentration normally used for the top standard. For comparison, a set of standards was prepared without DTT—that is, one volume of assay standard (at nine times the usual concentration of the top standard) diluted with eight volumes of NaCl. Doubling dilutions were performed on each mixture to produce the recommended range of standards for each assay. The median levels of IL-1β, IL-6, IL-8, SLPI, and NE were similar in samples processed with DTT and NaCl (table 2). However, the median levels of detectable TNFα, LTB4, and MPO were significantly lower in the DTT treated samples and there was a small but significant increase in the median α1-AT concentration in the DTT treated samples (table 2). Agreement between the two methods of sputum processing for the detection of each mediator is shown in fig 1, according to Bland and Altman. As recommended by these authors, the data have been log transformed before analysis to produce differences that are unrelated to the mean. The mean difference, with 95% limits of agreement, for the log data is shown on each figure. The antilogarithms of these values—that is, the ratios of measurements by the two methods—are shown in table 3. Thus, the levels of IL-1β measured in NaCl treated sputum differed from that measured in DTT treated samples by 0.204–3.408 times that detected in DTT treated samples for most measurements. These limits of agreement were marginally narrower for α1-AT but were wider for the other mediators, particularly SLPI, TNFα, and MPO (table 3). 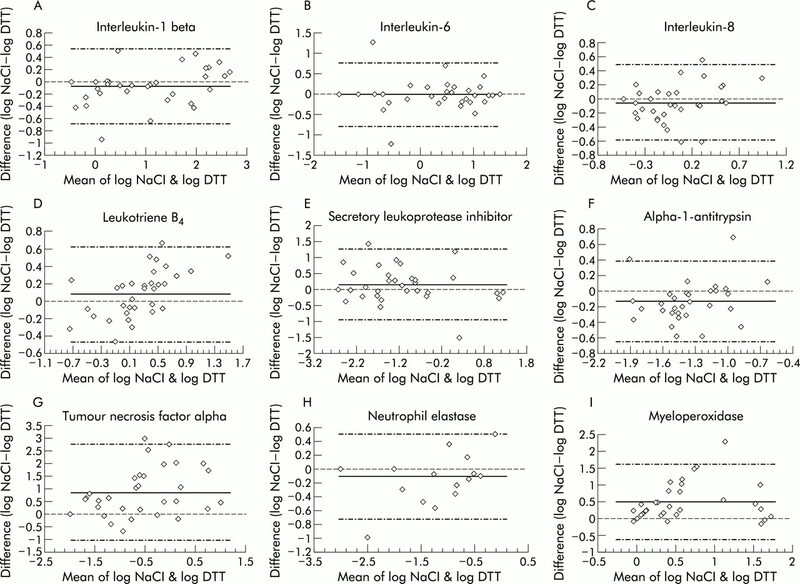 Mean differences ±2SD in (log transformed) levels of inflammatory mediators between sputum treated with dithiothreitol (DTT) and NaCl plotted against the mean of the two values for IL-1β, IL-6, IL-8, LTB4, SLPI, α1-AT, TNFα, NE, and MPO. The addition of DTT did not influence the detection of the assay standards for IL-1β, IL-8, or TNFα. However, DTT did have an effect at higher concentrations on IL-6, SLPI, and NE standards (43%, 70%, and 76% of control value for top standard, respectively). This effect diminished with increasing dilution so that the measurement of the DTT treated standards was greater than 85% of the control value at a 1:32 dilution for IL-6 and SLPI, and at a 1:2 dilution for NE (fig 2A–C). Leukotriene B4 measurements were markedly increased in the DTT treated standards. The top standard was 643% of the control value and, although this effect again lessened at lower dilutions, the DTT standard remained 120% higher than the control at a 1:64 dilution (fig 2D). There were some differences in the two sets of standards for the α1-AT assay at higher concentrations of DTT, although the pattern was not consistent and beyond a 1:32 dilution the DTT standard was within 15% of the control value (fig 2E). Finally, DTT completely abolished the detection of MPO standards at all dilutions (fig 2F). Results for assay standards treated with dithiothreitol (DTT) plotted against standards treated with NaCl for IL-6, SLPI, NE, LTB4, α1-AT and MPO. Dashed line indicates line of equality. In this study we found that the median levels of the inflammatory mediators IL-1β, IL-6, IL-8, SLPI, and NE were similar in saline and DTT treated sputum. However, DTT treatment resulted in significantly lower median levels of TNFα, LTB4, and MPO, and a small but significant increase in median levels of α1-AT. Furthermore, agreement between the two methods of sputum processing was poor with wide 95% limits seen for all mediators measured. There are a number of possible mechanisms whereby sputum processing with DTT could have affected the detection of inflammatory mediators in the soluble phase. The effectiveness of DTT as a mucolytic agent arises from the fact that, as a potent reducing agent, it is able to split the disulphide bonds present in mucus glycoproteins and thus release sputum cells for analysis.14 However, by the same mechanism as for mucus glycoproteins, DTT could also affect the three dimensional structure of the mediators or the antibodies to which they are bound and measured in enzyme linked immunoassays. We examined this possibility in the second part of the study by comparing the detection of assay standards that had been “treated” with DTT or saline at similar concentrations to that used for sputum processing. We found that DTT completely abolished MPO activity at all dilutions and at higher concentrations it significantly reduced the detection of the assay standards for IL-6, SLPI and NE, but produced spuriously high levels of LTB4 and, to some extent, α1-AT. The marked increase in LTB4 measured in DTT treated standards is probably the result of the competitive nature of this assay. The LTB4 present in the sample competes with a fixed quantity of peroxidase labelled LTB4 for a limited number of binding sites on a specific antibody. The amount of peroxidase labelled ligand bound by the antibody, determined by the colour reaction following the addition of tetramethylbenzidine (TMB), is inversely proportional to the concentration of unlabelled LTB4 in the sample. Therefore, if DTT interferes with antibody-ligand binding, neither the labelled nor unlabelled LTB4 will bind to the plate so there will be no colour change following the addition of TMB which would be interpreted as being due to high levels of unlabelled LTB4 in the sample. Alternatively, the peroxidase label of the antibody could be inhibited by DTT, but this would seem unlikely as peroxidase labelled antibodies are also used in the IL1-β and IL-8 assays and neither of these two assays were affected by DTT, presumably because the washing process removes any remaining DTT before the addition of the substrate. For the measurement of MPO we used a chromogenic substrate activity assay, as we have previously shown that the immune assay for this mediator gives poor recovery and is dependent on the degree of sample dilution and elastase content.12 However, the MPO activity assay was particularly susceptible to interference from DTT, which probably relates to reduction of either the reactive oxygen species generated by MPO in this assay or the hydrogen peroxidase substrate itself. The effect of DTT on the measurement of assay standards did not always correspond to its effect on the detection of the mediators in sputum samples. This may relate to the sample dilution required to achieve mediator measurements within the working range of the assay (as for SLPI and NE), which may be sufficient to remove any interference from DTT on the assay performance. However, the dilutions at which the samples were assayed for IL-6 and LTB4 were within the range where DTT did affect these assays, yet the median levels of IL-6 were similar in the DTT and saline treated samples and the median level of LTB4 was reduced—not increased—in DTT treated samples. This suggests that, during the process of mucolysis, the activity of DTT is likely to be neutralised to some extent, thus reducing its consequent effect on the immunoassay. However, mucolysis with DTT may also cause the release of mucus bound molecules from the sputum. These may include binding molecules such as soluble receptors, carrier proteins, and autoantibodies, all of which have the potential to interfere with the detection of inflammatory mediators in immunoassays.15 This may explain the significantly lower median LTB4 and TNFα levels in DTT treated sputum samples despite the predicted effects of DTT on the assays (increased detection in the former and no effect in the latter). Finally, mucolysis with DTT could also release mucus bound mediator which may explain the small but significant increase in α1-AT seen in DTT treated sputum samples which were diluted sufficiently to remove any direct interference from DTT on the assay performance. It could be argued that the reduced concentrations of TNFα, LTB4, and MPO in DTT treated sputum are not relevant when measuring these mediators in paired samples that have both been processed with DTT—for example, when comparing airway inflammation at the start and end of a treatment period. However, the effect of sputum processing with DTT on TNFα and MPO was to reduce measurable concentrations of these mediators to levels that were near to, or below, the lower limit of detection for the assay, thus reducing the likelihood of detecting any significant difference between two samples that have been processed in this way. Furthermore, the fact that DTT affects the detection of some mediators, and not others, would also make it difficult to relate the concentration of a mediator to its function when the whole sample has been processed with DTT. This study has shown that the treatment with DTT of whole spontaneous sputum from patients with chronic bronchitis and bronchiectasis does not significantly affect median levels of IL-1β, IL-6, IL-8, SLPI, and NE, but does significantly reduce the median levels of detectable TNFα, LTB4, and MPO and produces a small but significant increase in the median α1-AT level. Furthermore, agreement between the two methods of sputum processing is poor, which suggests that they should not be used interchangeably for the measurement of inflammatory mediators. To avoid these problems we recommend that an untreated aliquot of sputum be retained for the measurement of inflammatory mediators unless the assay has been specifically validated. Magnussen H, Hargreave FE. Noninvasive monitoring of airway inflammation. Eur Respir J2000;16:1–2. Maestrelli P, Richeldi L, Moretti M, et al. Analysis of sputum in COPD. Thorax2001;56:420–2. Efthimiadis A, Pizzichini MM, Pizzichini E, et al. Induced sputum cell and fluid-phase indices of inflammation: comparison of treatment with dithiothreitol vs phosphate-buffered saline. Eur Respir J1997;10:1336–40. Louis R, Shute J, Goldring K, et al. The effect of processing on inflammatory markers in induced sputum. Eur Respir J1999;13:660–7. Grebski E, Peterson C, Medici TC. Effect of physical and chemical methods of homogenization on inflammatory mediators in sputum of asthma patients. Chest2001;119:1521–5. Anon. Definition and classification of chronic bronchitis for clinical and epidemiological purposes. A report to the Medical Research Council by their Committee on the Aetiology of Chronic Bronchitis. Lancet1965;i:775–9. Morrison HM, Kramps JA, Burnett D, et al. Lung lavage fluid from patients with alpha 1-proteinase inhibitor deficiency or chronic obstructive bronchitis: anti-elastase function and cell profile. Clin Sci (Colch)1987;72:373–81. Bland JM, Altman DG. Measuring agreement in method comparison studies. Stat Methods Med Res1999;8:135–60. Wooten OJ, Dulfano MJ. Improved homogenization techniques for sputum cytology counts. Ann Allergy1978;41:150–4. Mire-Sluis AR, Gaines-Das R, Thorpe R. Immunoassays for detecting cytokines: what are they really measuring? J Immunol Methods1995;186:157–60. Pizzichini MM, Popov TA, Efthimiadis A, et al. Spontaneous and induced sputum to measure indices of airway inflammation in asthma. Am J Respir Crit Care Med1996;154:866–9. Funding: I Woolhouse is funded by a Boehringer Clinical Fellowship.